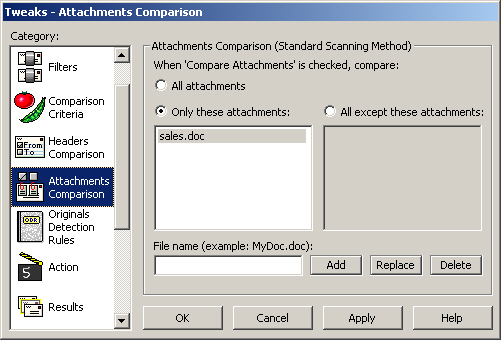 Delete Duplicates for Eudora finds duplicate messages and attachments with diligence and sophistication in your Eudora folders, and it removes them automatically, too. It's a pity Delete Duplicates does work with mail stored locally only. Delete Duplicates for Eudora enables you to delete duplicate e-mail messages from your Eudora mailboxes. It is a plug-in, i.e. 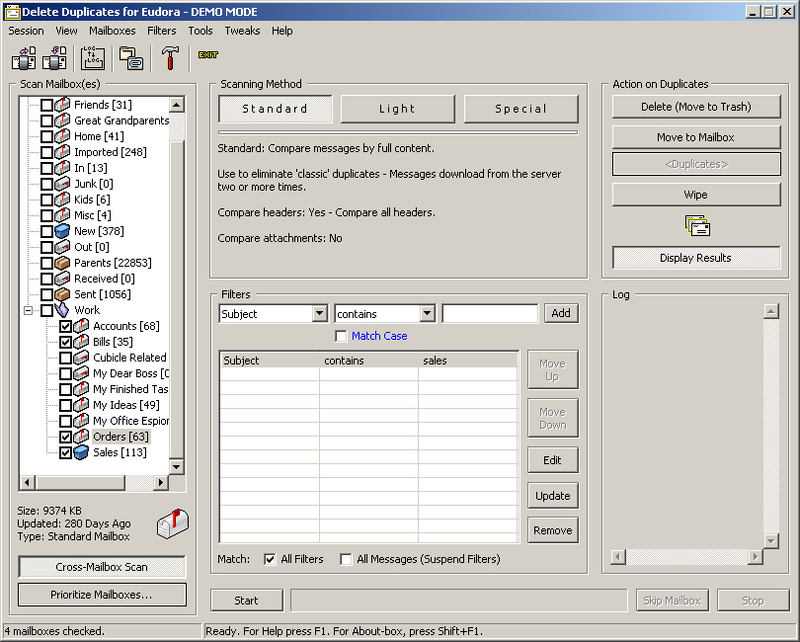 an auxiliary program that interfaces with Eudora (for many people the e-mail software of choice), can operate in and on the Eudora environment, and provides functions that Eudora itself does not provide. 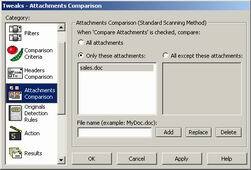 Why the need for this program, since if you see duplicates you could delete them yourself? The answer is that many people now conduct much of their professional and personal communication -- indeed much of their professional and personal lives -- via e-mail, and some people use Eudora as their filing system for correspondence. This leads to a situation in which people have hundreds or thousands of Eudora mailboxes on their computer, containing thousands or tens of thousands of messages, and this can make it difficult or impossible to even spot duplicate messages, especially if they reside in different mailboxes. A variety of conditions, ranging from mail server errors to events that occur on one's own computer -- such as explicitly copying messages via a Eudora mail filter, moving or copying and amalgamating mailboxes, especially in moving files from one drive to another or one computer to another, restoring backed up mail files, and so on -- can lead to the presence of duplicate mail messages. While some people may not care about these, anyone who either likes having an organized filing system or being able to keep track of whether messages have been responded to or appropriately handled will find such duplicates a nuisance, aside from the fact that they waste space on one's hard drive, especially when it is a question of not only one copy of a message but multiple copies. When you add to this the condition that multiple copies of a message with an attachment lead to multiple attachments, and that messages with embedded graphics, which are an ever larger portion of Internet e-mail, store multiple copies of these graphics files, we are talking about a potentially large mess! Fortunately, Delete Duplicates for Eudora will solve this problem and help you maintain an ordered mailbox and message system by eliminating duplicate messages, attachments, and embedded graphics, under a variety of conditions and according to a variety of user-selectable and configurable options. This will enable you to keep your Eudora mail in the kind of order that makes the most sense for the way you prefer to conduct your life, your profession, or your business. 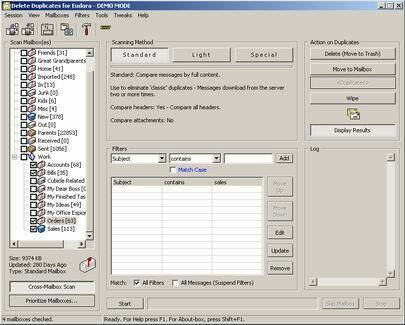 Delete Duplicates for Eudora is a shareware program. This means that you can use it with the limited set of features for free (Demo-Mode), or register the program and gain the access to the full set of features (Full-Mode). For alternative ways to order please checkout the Commerce section.